Oracle’s misguided attempts to belittle competition continues to undermine genuine progress. As the deliberate spread of misinformation continues to dominate news feeds, social media and mainstream outlets, the intention to delude has now entered the technology industry in full force. Spearheaded by a software supremo with an ego, one-time brash comments are fast turning into concrete slabs of truth, creating a misguided view of the market as a consequence. In this case, cloud is centrepiece and Oracle is the culprit. For Larry Ellison lives off the belief that ‘a lie gets halfway around the world before the truth has a chance to get its pants on’. Because after all, this is a man famed for outlandish comments, as illustrated by his bold predictions in 1993. "IBM is the past. Microsoft is the present. Oracle is the future." During the vendor’s recent quarterly earnings call, the founder and CTO’s continued criticism of Amazon Web Services (AWS) has helped to paint a very different picture of the cloud landscape today. In Ellison’s world, Oracle now has “a huge technology lead” over AWS, alongside Microsoft Azure, through a “faster and lower cost” approach to the market. Yet rather inconveniently for the software vendor, AWS and Microsoft are in fact racing away in the cloud, with both businesses reporting bumper sales as industry competitors struggle to keep pace. As reported by Business Insider Australia, AWS finished 2016 with $15.67 billion in revenue, alongside $4.05 billion in operating income profit. Yet bashing the competition without merit remains a common theme for Ellison, who also sought a headline moment at Oracle OpenWorld in September 2016, but once again, facts got in the way. On stage at the Moscone Center in San Francisco, the “Amazon's lead is over” rhetoric once again reared its ugly head. Ironically however, of those frantically hanging onto the coattails of AWS, Oracle is nowhere to be seen. Because despite the overwhelming dominance of AWS - in holding a market majority of over 40 per cent - Microsoft, Google and IBM are gaining ground in the burgeoning public cloud services market, at the expense of smaller players across the industry. As reported by ARN, in aggregate, the three closest competitors to AWS have increased worldwide market share by almost five percentage points over the last year and together now account for 23 per cent of the total public Infrastructure-as-a-Service (IaaS) and Platform-as-a-Service (PaaS) market, helped by particularly strong growth at Microsoft and Google. In examining the race for public cloud leadership, it must be galling for Ellison to see Oracle labelled in the “next 10” category, rather than as a standalone player, such is the vendor’s minuscule market share. But as Synergy Research suggested, Oracle and Alibaba continue to grow at “impressive rates”, suggesting future potential for the tech giant. “Both our SaaS and PaaS businesses are doing great, but I’m even more excited about our second generation IaaS business,” explained Ellison, during the vendor’s recent Q3 FY17 earnings call. Read more Why did Google acquire Australian-born Kaggle? Previously branded a ‘Grade A jerk’ by industry observers, Ellison’s misguided attempts to bring down the undisputed leader in cloud computing - by virtue of cold hard facts - is undermining Oracle’s genuine advancements in the industry. Yet in cutting through the nonsense, even Ellison’s biggest critic cannot argue that Oracle’s recent quarterly earnings call piled on the proof points that the vendor’s cloud business is here to stay. Specifically, the vendor reported credible cloud SaaS and PaaS revenue increases of 73 per cent year on year, reaching US$1 billion as a result for the quarter. “With legacy business declines inevitable and most pronounced on the applications license and hardware segments, Oracle executives continued to highlight new customers and growth in all areas of cloud,” Technology Business Research Analyst, Meaghan McGrath, observed. For McGrath, one notable change in the messaging came from Ellison specifically, who evolved on his original stance that the opportunity in PaaS was bigger than that in SaaS, to now assert that early traction of the second-generation IaaS indicates the IaaS business will “be leading the way in the future” as the largest of all. 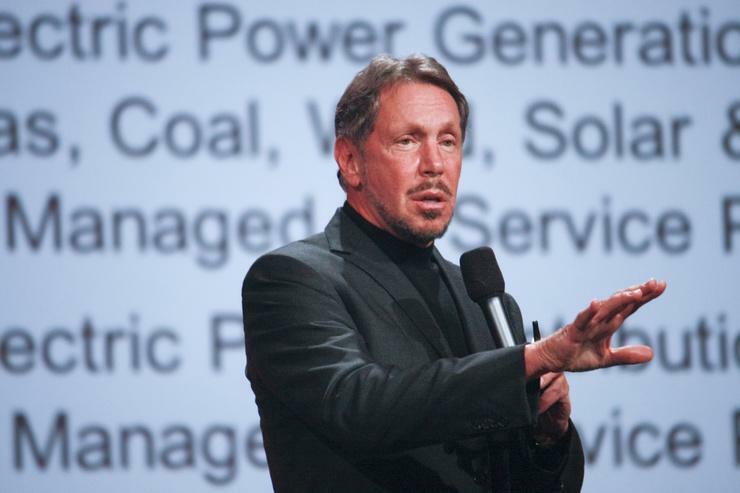 This rapid growth is, according to Ellison, set to take place over the next five years as the majority of Oracle database customers maintain and lift their licenses to Oracle IaaS amid other vendor workloads also being moved to the infrastructure. “It is increasingly evident that while Oracle’s initial push into the cloud market was to protect the more immediately threatened applications install base, the company has been able to acquire and build its way to a successful SaaS portfolio that it expects will once again pale in comparison to its database install base’s move to the cloud,” McGrath added. In examining the facts, it’s apparent that Oracle is building a cloud practice in the hope of providing credible market competition. But what isn’t clear is why Ellison believes hammering the outright market leader without merit remains a viable strategy.